MalloMe Travel Mug Just $14.99! Down From $70! You are here: Home / Great Deals / Amazon Deals / MalloMe Travel Mug Just $14.99! Down From $70! Don’t miss this amazing deal from Amazon! Get this MalloMe Stainless Steel Travel Mug for just $14.99, down from $69.99 PLUS FREE shipping with Amazon Prime and for orders $25 or more! Blending style & flawless functionality, MalloMe brings you a new superior Stainless Steel Travel Mug! Sleek looking & designed to perfection, the MalloMe Stainless Steel Travel Mug will keep beverages hot for 6 hours or cold for 24 hours, while providing 100% leak-proof insulation. No matter where and how you travel, you are protected by our premium 100% leakproof lids. Drop or shake, this strong travel mug will keep you completely protected. Enjoy your favorite beverages anywhere, anytime! NEVER WORRY ABOUT SPILLS AGAIN: No more stains on shirts and pants when you’re in a rush on your way to work. Your coffee, tea, or water is fully insulated and protected by our 100% leak and spill proof flip back locking lid. FREE BONUS wide-mouth water bottle lid included with stylish silicon ring and hook design for mobility. ENJOY THE UNIQUE DESIGN: Feels & looks incredible with our unique cola bottle bottom design. Absolute best in class when it comes to holding your cold and hot drinks when you are traveling or on the go. NUMEROUS USES: Take the vacuum insulated large stainless steel coffee mug with lid wherever you go. 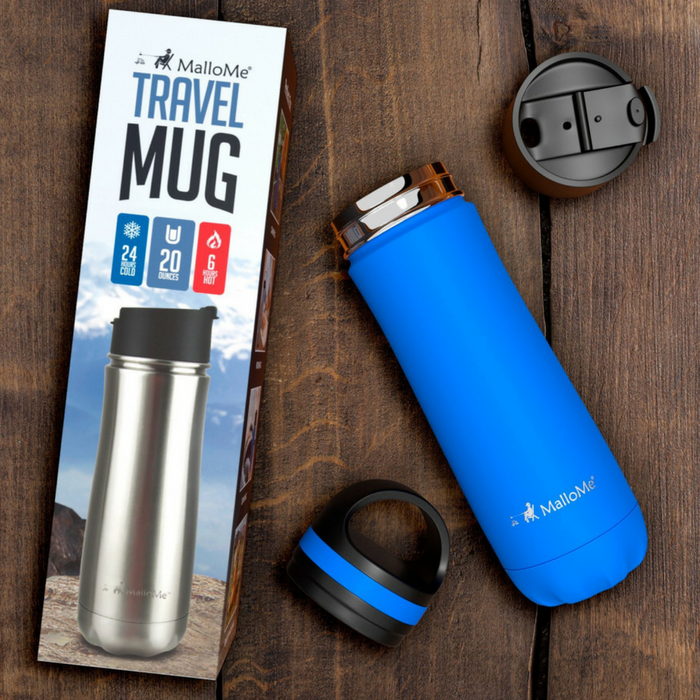 No matter if it is an outdoor activity like camping & hiking, or everyday activity like work, office, gym, or school your MalloMe water and coffee mug will always come in handy.